According to the Centers for Disease Control, there are over 600,000 people in the United States that use heroin. Heroin use is associated with a variety of infectious diseases including HIV, AIDS and Hepatitis and it is estimated that 5,000 people in the US die each year due to heroin overdose. Heroin is an opiate drug that is derived from the opium poppy plant much like morphine. According to the NIDA approximately 1 in 4 people who use heroin become physically dependent. It comes in a white or brownish powder or a black sticky substance also known as "black tar." Users may snort, smoke, sniff or inject heroin. Mixing heroin with other drugs such as cocaine, benzodiazepines or other opiates increases the risk of overdose and death. As Heroin enters the brain, it affects the opioid receptors; giving a euphoric feeling. Euphoria is followed by feelings of warmth, drowsiness, impaired judgment and dry mouth. With prolonged use the user develops a tolerance and it takes more and more of the drug to reach the same feeling of euphoria as before. Possible side effects from using heroin may include nausea and vomiting, skin that feels itchy, constipation, slurred speech, twitching, decreased breathing, nightmares, hallucinations and convulsions. Long term heath issues that come with prolong use include respiratory and pulmonary problems, liver failure, permanent damage to the brain and heart, and increased risk of overdose. Withdrawal symptoms from heroin may begin within a few hours after the last dose of the drug and will peak around the third day of ending heroin use. Withdrawal symptoms can include insomnia, diarrhea, jerking movements of the extremities, agitation, severe muscle and bone pain. Detoxing from heroin can be quite uncomfortable. 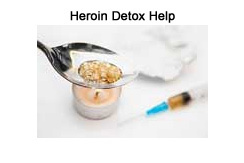 Many people report that detoxing from heroin, is like having an intense flu. Symptoms can last from 4 to 7 days depending on the amount used. While most people detox from heroin on their own, many choose to seek help at a medical detox facility. The safest and most comfortable method for detoxing from heroin is IV therapy. Detox centers that offer these services typically include a physical, psychological and social health evaluation that will allow doctors to create a customized detox plan specially designed for you. Your detoxification will be implemented through the use of IV therapy that will make it possible for doctors to adjust your medication as needed to ensure your safe and effective detox from heroin. IV therapy allows doctors and nurses to address your withdrawal symptoms immediately to keep you comfortable throughout the process. At the best rated detox programs, your health will be monitored around the clock. Once you have completed your detox, you may feel the need to enroll in a program that will help you make significant lifestyle changes to ensure that you achieve long term success. Freedom Model Retreats offers a Cognitive Behavioral Learning program that can help you take control of your. Drug use is a choice and through Freedom Model Retreats, you will be empowered to change your thought and behavior habits, to develop positive and productive habits and to make and implement a plan for long term success. You can join the thousands of people who have left heroin use behind them forever, and build the life you truly want.